Maryland State Department of Education released its 2018-19 report card this week, displaying schools’ performances across the state and in Wicomico, Worcester and Somerset counties. The data includes a broad number of performance indicators. Along with student success and growth on state tests in English Language Arts and mathematics, the Maryland Report Card factors in progress in achieving English language proficiency for English learners, chronic absenteeism, preparation for post secondary success, access to a well-rounded curriculum and graduation rate, according to a news release. In the future, the report card will include student and faculty survey results. Lower Shore school systems saw a combination of star ratings. In Wicomico, two-thirds of all eligible schools received a four-star rating. Neighboring Worcester County received all four stars. Somerset County schools saw three and four star ratings. “We will now take the data and continue to grow, set expectations for all schools to continue to improve daily and improve in the ratings,” said John Gaddis, superintendent, in a news release. 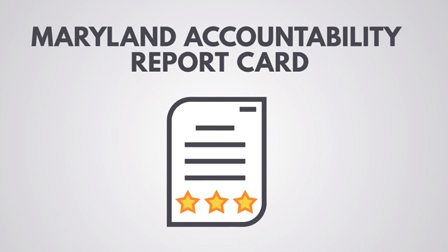 The report card can be found at Reportcard.msde.maryland.gov. What is the Maryland Report Card and what does it show? The new report card allows individual schools to receive points based on their results on the performance indicators, according to a news release. Each school receives a star rating ranging from one to five stars. Viewers can read a summary of performance by looking at a school’s rating which tallies the school’s total earned points percent or the percentile rank. “The new report card is much more inclusive, 65 percent of it deals with academic measures with the other 35 percent being about school quality and student success. So we think it gives a better overall picture of the quality of the schools,” said Rick Briggs, Wicomico County Board of Education assistant superintendent and chief academic officer. He emphasized how these new factors help foster school improvements within the school system. The new Maryland Report Card is a reaction to the Every Student Succeeds Act , signed into law in 2015. ESSA succeeded the No Child Left Behind Act in governing state school improvement plans, according to a news release. ESSA prompted states to develop long term plans to improve schools through accountability and innovation.The State plan was approved by the U.S. Department of Education in early 2018, according to a news release. How do percentages relate to star ratings? Make note that not every school is eligible for a star rating as not all schools receive 45 or more possible points. Schools that don’t administer state assessments are not given a star rating. Briggs said all of Wicomico’s schools with students grades kindergarten to grade two are not rated as they are not given state assessments. What does this mean for parents? Briggs said parents should find the information within the new report card informative. “As a father of two kids in the school system, I already have looked at the two schools in which my kids go to,” he said. Parents will be able to see what areas where their child’s school is doing well and where it needs to improve. Briggs said one issue Wicomico has already taken note of with the report card is chronic absenteeism which is bringing down the ratings of some of the school system’s middle and high schools. “That was probably one of the biggest eye openers when we started drilling down into the data as to where we weren’t getting points,” Briggs said. He said principals with high absenteeism have already begun reaching out to families about why attending school regularly is important. Briggs encouraged parents to reach out to the administrators at their child’s school to discuss the data if they’d like to talk more in depth. Parents can also ask what they can be doing to help increase a school’s rating. What does this mean for school systems? Briggs said Wicomico has already begun discussing each school’s data with principals. “They can see where are their students doing well and where do they need to improve upon,” he said. He’s already heard from principals who are working on making instructional adjustments and contacting parents to work on improving their ratings. He knows there’s a constant want from school officials to score better and move up in percentage. “We’re going to strive for continuous improvement,” Briggs said. Posted in Accountability, Advocacy, Department of Education, Education Budget, Educators Protest, Evaluations, Every Student Succeeds Act, Failing Schools, Funding For Education, Higher Education, Janus, Mental Health, No Child Left Behind Act, Parents, Pension & Salary, Retirees, School Choice, School Closings, School Safety, Special Education, Students and Parents Protest, Teacher Evaluation, Teacher Shortage, Technology in the Classroom, Testing and tagged "Standing Strong for Public Education", #iBelieve, Accountability, Accountability System, Advocacy, Department of Education, Diversity, Education, Education Funding, English Language Learners, Equity, Every Student Succeeds Act (ESSA), Failing, Failing Schools, Federal Education Policy, HBCU, High-Needs Students, NEAExecutiveCommittee, Public Education, School Choice, School Nurses, School Safety, State Budget, Students, Tax, Testing and Accountability. Bookmark the permalink. How much should Utah teachers be paid? A new group is trying to figure that out.